Death Note 2 is officially being developed by Netflix. The streaming service released their live-action take on the popular Manga last year, which was mostly met with mixed-to-negative reviews. Since Netflix doesn't release their actual streaming numbers, it's hard to say exactly how well the movie did for them. Despite not knowing the exact figures, the company clearly feels it did well enough to warrant spending a decent chunk of change on a follow-up, which is currently being scripted. Head of Netflix's movie division Scott Stuber is determined to make an impact on the movie side of things and part of that is going to include making franchises, whether or not those movies appear to be popular on Rotten Tomatoes. Case in point, the first Death Note has just a 40 percent approval rating from critics and a very poor 24 percent audience rating. 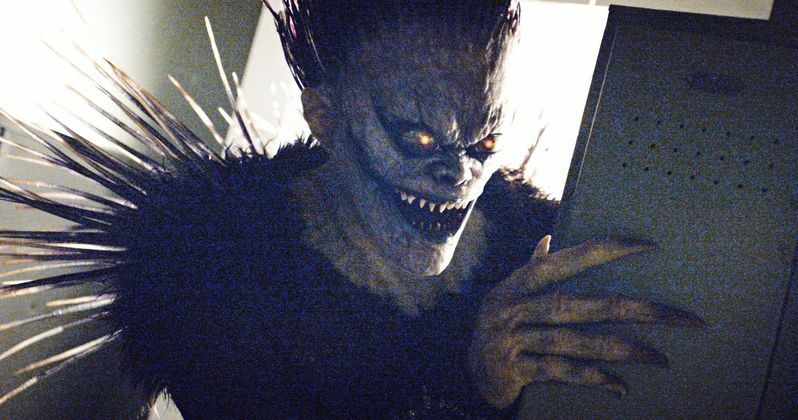 Despite that, Death Note 2 is already coming down the pipeline, with Greg Russo on board to pen the sequel. He's an up-and-comer, having worked on the new Resident Evil reboot and the long-gestating Mortal Kombat movie that can't seem to get off the ground. This comes as part of a larger report detailing the future strategy of Netflix on the movie side of things. The company has had a lot of breakout hits in the TV department, such as Stranger Things and Orange is the New Black, but they have yet to really do the same with any of their original movies in the same way. Scott Stuber and his team will be more selective in the future. The streaming service apparently has their eyes on stuff, "as big as Marvel superhero pics and Lord of the Rings-style fantasy fare." On the flipside, they're gunning for more prestige projects, such as the upcoming Roma from Alfonso Cuaron, July 22 from Paul Greengrass or Martin Scorsese's The Irishman. Looking at Death Note 2, there are currently no plot details available. It sounds like the project is in the earlier stages of development. It's also unclear as to whether or not director Adam Wingard will be back at the helm, but don't bet on it. He previously directed the Blair Witch sequel and is currently signed on to direct Godzilla vs. Kong, which is scheduled for release in 2020. That means he's going to be pretty busy for the next couple of years and it seems pretty unlikely he'll be able to find the time to squeeze this in. It is, however, quite likely that the core cast will return, including Willem Dafoe as Ryuk. In addition to Death Note 2, Netflix is also still moving forward with plans for Bright 2, which will see director David Ayer and star Will Smith both return. Similar to Death Note, Bright was also panned by critics but it drew in a managed to draw a rather large audience, based on numbers that were released by Neilson, which the streaming service neither confirmed or denied, in terms of accuracy. This news comes to us courtesy of The Hollywood Reporter.